Lewis Hamilton won the Hungarian Grand Prix to take his first victory since October last year and complete a remarkable turnaround for McLaren. The Englishman took the lead after pole-sitter Fernando Alonso's Renault made an early pit stop and dominated ahead of Ferrari's Kimi Raikkonen. Red Bull's Mark Webber was third with Brawn's Jenson Button down in seventh. The Australian replaces team-mate Sebastian Vettel, who retired, in second place in the world championship. Vettel, who suffered a front suspension failure while running eighth on lap 27 of 70, slips to 23 points behind the Englishman with seven races remaining and a maximum of 70 points available. Nico Rosberg was fourth for Williams ahead of Hamilton's team-mate Heikki Kovalainen, Toyota's Timo Glock, Button and the second Toyota of Jarno Trulli. Raikkonen's second place was a big boost for Ferrari who had gone into the race with only one driver following Felipe Massa's high-speed crash in qualifying, which resulted in the Brazilian undergoing emergency surgery on serious head injuries. "Maybe I can speak for all of us, but today was a sad day given what happened with Felipe," said Hamilton. "We miss him, wish him well and we all wish him a speedy recovery." Raikkonen was investigated by race stewards following a coming together with Vettel at the start of the race but the officials decided not to take any action. Our car is not what it was to drive a few races ago. It's not like it was at the start of the season, there is obviously an issue. Red Bull, who dominated the last two races in Britain and Germany, put in a surprisingly uncompetitive performance but they were in much better shape than Button. The Englishman qualified eighth, but was starting on a heavy fuel load and was optimistic he would have a strong race. Instead, he was unable to make any impression on the cars at the front. For the first time this season, that meant McLaren, whose form here confirmed that the revised aerodynamics they introduced in Germany two weeks ago have transformed the car. "It's an incredible feeling to be back here after what feels like such a long time away, and such a struggle with me and my team. 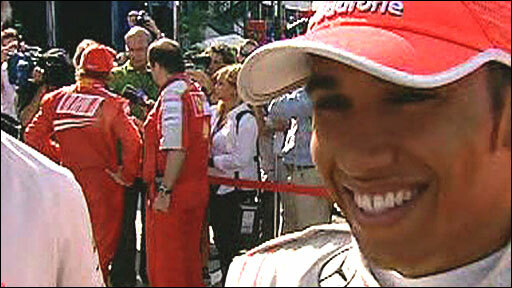 I'm just so proud of the guys," said Hamilton. "Everyone's pushing and wants to win as much as I do, which is pretty rare with such a large group of people. But we didn't expect to win this weekend. "Undoubtedly we have caught up [with other teams], but we didn't think we could win." McLaren started the season with an uncompetitive car, struggling in most races to even get into the points. 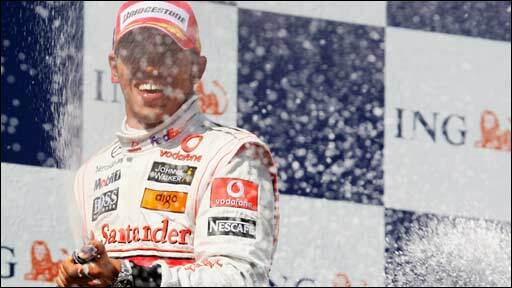 Hamilton, the reigning world champion, had not even managed to finish on the podium until winning this race. Having qualified fourth, Hamilton used his Kers energy storage and power-boost system to challenge the leaders at the start. Button was not happy with his car after seeing his drivers' championship lead cut to 18.5 points. "After four laps my tyres were destroyed. I had rear graining and couldn't keep up with the cars in front. "Our car is not what it was to drive a few races ago. It's not like it was at the start of the season, there is obviously an issue." Alonso got a good start from pole position and retained first place but Hamilton briefly got up into second place at the first corner before being re-passed by Webber. The Red Bull was expected to be the strongest car in the race but, while Alonso initially built a small gap, Webber found himself under pressure from Hamilton, who passed him on lap five and proceeded to pull away and close on the Renault. Alonso, who had planned to do a three-stop strategy in contrast to the two stops of most of the rest of the field, pulled in for his pit stop on lap 11. He was released a fraction too early before the right front wheel was fully attached and it parted company with the car part way around the lap and was forced to retire with the consequent damage and a fuel pump problem. By the time all the front-runners had done their stops, Hamilton had a six-second lead over Raikkonen and he was able to control the race from the front. Webber slipped behind Raikkonen after a problem with a front wheel at his pit stop and he was also passed by Toyota's Timo Glock as he rejoined. Red Bull later received a reprimand from the race stewards for releasing Webber from his pit stop right into the path of the oncoming Raikkonen. The Red Bulls lacked their recent pace but Webber drove consistently well to take the final podium position and make it a good race for him from a championship point of view. By contrast, his team-mate Vettel had a disastrous weekend, making a poor start from second on the grid and running eighth in the early laps. 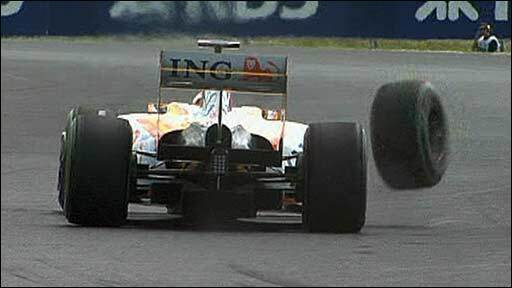 He was running behind Rosberg when he suffered a front suspension failure on lap 27 and was forced to retire. Toyota, both of whose drivers qualified outside the top 10, used a long first stint to put themselves in contention for the minor points places. Button finally showed some pace in the closing laps once the track was coated in rubber and he was back on the softer tyres after using the harder ones in the middle stint. That lifted him to seventh from eighth, but he will still be concerned at a third consecutive uncompetitive race.